There’s apparently been a lot of press — all of which I’ve missed — about the Lowline. 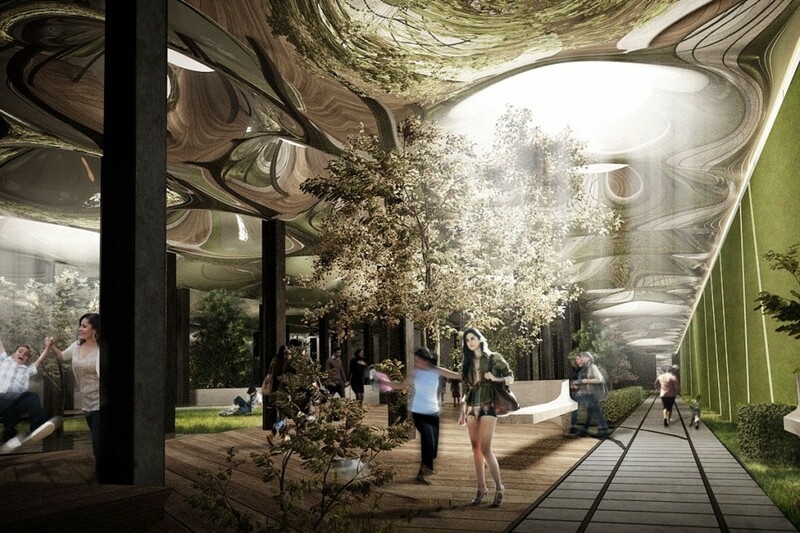 In case you too haven’t heard, the Lowline aspires to be the world’s first underground park, tucked inside an old trolley terminal on Manhattan’s Lower East Side. Last night I went to a talk by the Lowline’s two visionaries, James Ramsey and Dan Barasch, who view their project as a cousin of sorts to the High Line and who are taking a similar grass-roots approach to convince the city to transform this unused area into a landmark public space. The MTA controls the space due to its historical roots as the Williamsburg Trolley Terminal which shuttled passengers from October 1904 – December 1948 between Williamsburg, Brooklyn and the Lower East Side, passing underneath Delancey and Essex streets. The reason why the Terminal’s space is wider than you might expect is that it includes 8 loops which the trolleys used to turn around (and which in the picture below resemble the tops of tennis racquets). An overhead shot of Delancey Street and the Terminal, with the Williamsburg Bridge disappearing in the lower right corner. Here’s what the loops looked like at their underground level. The Lowline could serve as a model for urban areas around the world — and there are even a bunch more abandoned stations throughout New York which might also be candidates which you can see here at a site called…Abandoned Stations. If you’d like to learn more about the Lowline or make a donation to the cause, you can visit their site at DelanceyUnderground.org.